While some laptops are designed to meet a budget price, others are considerably more expensive and drop in price when budget components are added. 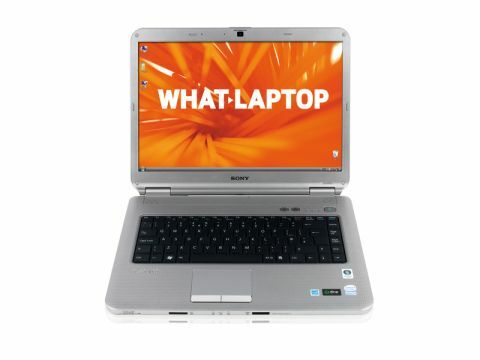 The Sony VAIO VGN-NS20E/S (£480 inc. VAT) is a great example of this, with previous models starting off considerably more expensive. As such, you'll find one of the best screens at this price point, although it's still bettered by the excellent Acer Aspire 5735-583G16Mn. This 15.4-inch panel isn't quite so sharp, but colours are reproduced vibrantly and it's still an impressive laptop at this price for watching movies or editing photographs. You'll find an integrated Intel GMA 4500M graphics card, offering moderate 3D performance. While not capable of playing anything more than the simplest of games, there's enough power for office tasks, multimedia presentations or watching DVDs. The Sony features an excellent keyboard, with large and responsive keys. They're slightly tapered at the edges, making it easy to type without any mistakes, and a springy typing action offers impressive comfort. It is a noisy board to type on, however, which won't suit all users. Build quality is excellent, highlighting this machine's more expensive origins. Finished in silver, it's a stylish laptop, and the textured plastics are robust. The thick screen surround offers plenty of protection, and with an overall weight of 2.8kg this is a system you'll be able to take on the commute without any trouble. The main sacrifice this laptop makes in order to meet the budget pricing is the use of an Intel Pentium Dual-Core T3400 processor, and it's this machine's Achilles heel. It runs at 2.16GHz, but it lacks the power of the Core 2 Duo chip. Even backed by its 3072MB of DDR2 memory, we found performance was considerably less than its rivals. That said, as long as you don't need to multi-task, you'll still be able to perform standard office tasks without trouble. The 250GB hard drive is ample, offering more than enough space for your documents, photos and other media files. 802.11n Wi-Fi and Gigabit Ethernet offer comprehensive networking for the home or office, and Bluetooth enables wireless connections to other digital devices. A multi-format DVD rewriter lets you store up to 8.5GB of data on blank dual-layer DVDs, and Roxio's Easy Media Creator software is preinstalled to make backing up a simple process. The NS20E/S remains an impressive laptop by virtue of its design and quality. It's just such a shame that it's hobbled by poor performance.